Firstly, where is this area? 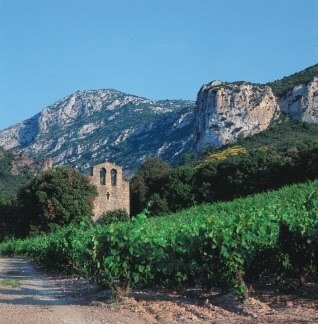 It is based in the Languedoc, south of France. It incorporates the Aude and the Pyrenees Orientales departments of the Languedoc. It is best known for its wines, but there is so much more to discover. swimming, boating, or windsurfing, but it would be a shame because there is much to discover in the hinterland. The region also has well-preserved medieval abbeys -- the most notable being at Fontfroide and Lagrasse .There are also some fine examples of Romanesque architecture, often to be seen in the tiniest village churches. It is the most characteristic feature of the region- namely the ruins of the Cathar castles. The most impressive are undoubtably Quéribus and Peyrepertuse. For the nature lover, the Corbières are a treasure trove; there are said to be 75 different species of orchids here, plus the typical vegetation and wildlife of the garrigue.There is a museum of flora and fauna at Gasparets and if you speak French well enough, you may be able to join a guided tour from Lezignan, Narbonne or Lagrasse . The best season for this is spring and early summer (May-June), when there is a profusion of wild flowers, and it is not yet too hot for walking. For anyone with reasonable French we recommend a book called Les Plus Belles Balades dans l'Aude by Patrick Valette and Jacques Drelon, published by the Office National des Forêts (try tourist offices or local bookshops). It contains 40 walks of varying length and difficulty, most of them off the beaten track, all clearly explained and with plenty of supplementary information about plants, wildlife, and local curiosities. During the summer (July and August) , when the French and France seem all to be on holiday, there is a profusion of local festivities and animations, many of them free. Leather-clad rock bands playing seventies and eighties hits complete with massive sound systems and laser shows are very popular. However there are also folk and jazz concerts, outdoor theatre, and impressive son et lumière presentations, notably in Carcassonne (one of the most important Cathar castles in France) and at the four Châteaux de Lastours. If your visit coincides with the 14th of July (Bastille Day -- a national holiday in France) many towns have firework displays, some more impressive than others. The one in Carcassonne is said to be second only to Paris in scale and splendour, and attracts up to 100,000 people. Gruissan, a small fishing village on the coast, is also developing an increasing reputation for its display, involving a sea battle on the lagoon which surrounds the town -- worth a visit if you can't face the traffic jams in and around Carcassonne. Local markets are a delight for the keen cook (vegetarian or otherwise) staying in self-catering accommodation or looking for picnic food. Mix shoulder to shoulder with the French and tourists alike. Stalls are piled high with ripe melons, delicious peaches, huge misshapen tomatoes with an incomparably sweet flavour, new crop pink and violet garlic, every variety of goat's cheese, tubs of olives flavoured with anchovy, garlic, or chili ... Stallholders range from the charcutiers with their big refrigerated vans to the old lady with a table on which she lays out her home-produced cheese, honey, and eggs. One of the best country markets is in Lezignan on Wednesday mornings; and for the ultimate in profusion, a visit to the 100-year old Halles (covered market) in Narbonne with its 80-plus stalls is essential. For those that are looking to invest in a house,villa or any other type of property for investing purposes, this area has much to offer. The sale of property is often used to renovate into a gite. The sale of an old cottage for instance can be found at prices starting at about 60 000 euros. Be prepared to invest a lot of time and money in this cottage to turn it into a comfortable Gite that could be rented out. Buy property for good returns as well. A modern villa, with good views, start at around 150 000 euros. France has become a great country to invest in, to buy a property in . Buy your dream house soon before the prices of French property rise too high.